I've known Ray Foote as "the guy who did the guitar on the original MTV station ID" for decades now, ever since my husband Paul worked with him at NYC's Elias Associates back when synths needed tuning. 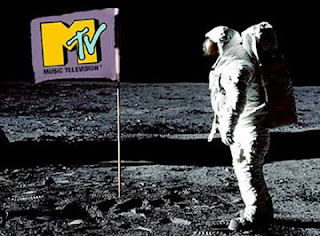 When MTV's 30th anniversary came around this summer, there was plenty of 80s tunes dusted off which I could still remember the video as it scrolled in my mind. For those there in the beginning, the chunky crank of solo guitar called out a new era of experiencing new music with a visual accompaniment. The moon man became icon for the fledging station, and he still appears on MTV's video music award statues even while the station rarely plays such things. Anyway, I thought it'd be fun to ask Ray for details about how he came to play on this epic moment of music history. Turns out it was a lucky convergence of college chums and rock 'n roll.